score on one of these tests. So what’s the difference between the two tests? One of the biggest differences is speed. 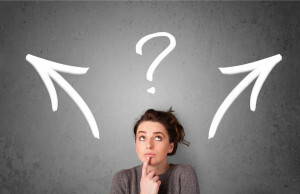 Would you rather ponder things deeply or answer more straightforward questions at a fast pace? This sums up one of the biggest differences between the SAT and the ACT. If you are more of a deep-thinker, the SAT may be a better test for you. If you would rather work quickly on more straightforward questions, then the ACT could be a better fit. The ACT covers a wider range of math concepts. The ACT tests more science. Science shows up only minimally on the SAT in the form of two scientific reading passages, but the questions don’t really test science. The ACT, by contrast, has a full science section. This section is intimidating to many students, particularly those who are not strong in science. However, don’t assume that the science section will be a struggle too quickly. While some basic science knowledge is required on some questions, the majority of questions require you to find information in charts and graphs and to evaluate the data given in the passages rather than to use outside knowledge. The SAT still tests tougher vocabulary. Obscure vocabulary words are no longer tested with sentence completion questions on the SAT. However, more difficult vocabulary still appears on this test than on the ACT, but it has a much smaller impact on the score than it did on the old verison of the SAT. The ACT tends to be a better test for students who prefer math and science and who don’t mind working very quickly through a lot of problems. The SAT tends to better for students who would rather think more deeply about problems at a slower pace. *Important note: This blog post refers to the new SAT that will be offered for the first time in March 2016. You have read through the new ACT essay prompt and the three perspectives and you are trying to figure out how to even get started. Here are some initial steps to get you off to a strong start. If you haven’t seen a new prompt for the new ACT essay, find a link to it here. Start your introduction by introducing the context of the argument. 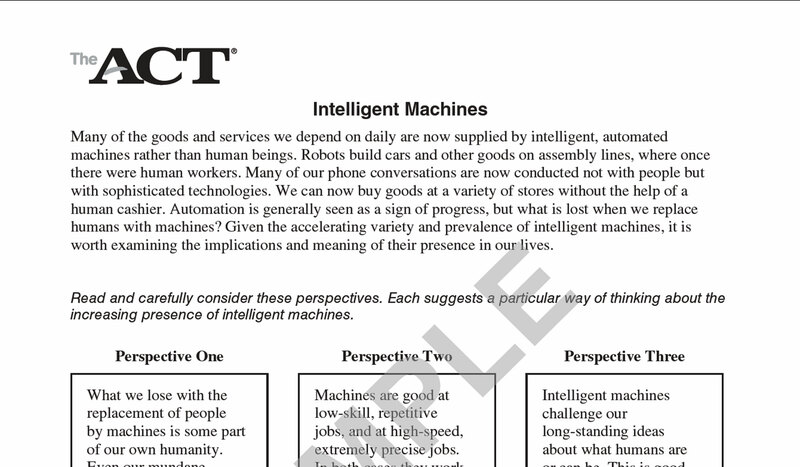 In the intelligent machines essay, discuss the various roles machines play in our lives. Then choose two opposite perspectives to agree with (so far it looks like it will be a good idea to use perspectives #1 and #2 for this) and put them together into your thesis statement. 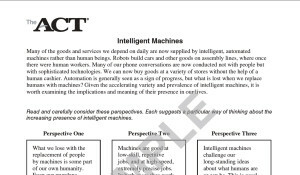 For example, in the Intelligent Machines essay, argue for the benefits of machines AND for the negative consequences of machines. Arguing both sides will help you to develop a complex argument and to build structure into your essay. Even if you completely disagree with one side of the argument, you need to find a way to argue for it initially. Now it is time to PLAN PLAN PLAN. What path will your argument take? Will you argue the benefits side of machines, only to turn to the downside of machines side of the argument and determine that the negatives outweigh the positives? Or will you take a more balanced perspective and argue that machines do a tremendous amount of good, but they can also cause problems when they play too large a role in our lives? 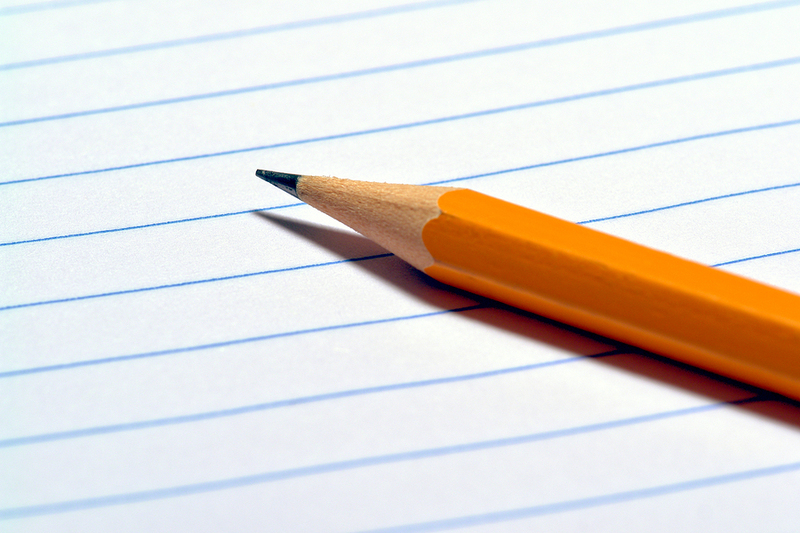 Before you start writing, there is one last thing to plan. Take a little bit of time to decide what you will do with the third perspective. (It looks like this perspective will either be a balanced perspective or a more philosophical perspective for one side of the argument.) Will you add it on to your positive or negative argument paragraphs? Or will you develop it more fully in a separate paragraph? Or, if it is a balanced perspective, can you work your way to this perspective as your conclusion? You will receive a separate score for organization on the writing section and the way to get a very high score in this area is to map out your argument ahead of time. OK, now it’s time to get writing. Stay tuned for the next blog post on how to effectively develop your arguments and write this essay. 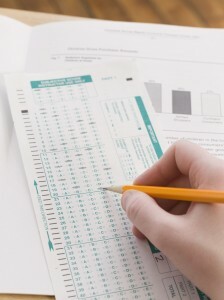 It’s a great idea to get a lot of practice tests (just make sure that they are good tests!) and to work hard to improve your score on the SAT or ACT on your own. However, if you are encountering any of these three problems, you are stuck and you need some outside help. But don’t immediately run out and sign up for a test-prep class. If you are scoring at least 1600 or higher on the SAT or 23 or higher on the ACT, you may not need a class. Classes are great to keep you working on the test even when you would rather be at the beach. But if you are very self-motivated and willing to put in the time to prepare for the test on your own, you may just need some guidance when you get stuck. You will want to search for a tutor who specializes in the test that you are preparing for and ask if they will provide guidance on what is going wrong on your tests and how to prepare on your own. I love it when I am contacted by students who are very motivated to figure out these tests on their own and who just need to meet with me for a few sessions to get unstuck. I analyze their test results to find patterns in what is going wrong. When I meet with them, I show them strategies for the areas that they are struggling with and we review the problems that they can’t figure out on their own. And then I send them off with a stack of assignments and instructions to get back to work on improving their score. Click here to email me your questions! You have the questions you need to determine whether the SAT classes you are looking into will be a good fit for your child and whether the class will use the best materials. In this post I will give you some questions to ask about what I feel is the most important part of any SAT class: The use of practice tests. Question #6: How will practice tests be used? Practice tests are an essential part of SAT prep. No matter how well a student learns the concepts tested on the SAT, he will not be truly prepared until he practices taking timed SAT exams to get used to the format and timing of the test, as well as the to actual questions that show up on the SAT. The timing of these exams is very important. Some classes give practice tests every week or even more often. And most students in these classes get the same score on test after test, showing that this approach is not benefitting them at all. It is a far better use of time to really learn the concepts tested on the SAT before starting to take a lot of practice tests. I have found that in some cases offering too many practice tests too quickly can actually hurt students. They go through all of the available College Board tests without getting any real benefit out of them. Then they are left to try to improve their score with alternate tests from other sources that simply don’t provide the score increases that real College Board tests do. So this may very well be the most important question you ask. Question #7: How many practice tests will be offered? Once a student has a solid understanding of most of the concepts, I would advise that he take at least 3 practice tests. And I advise taking even more if he is shooting for a large score increase (greater than 500 points) or a very high score (over 2000). Question #8: Will the class go over each test thoroughly? One of the most important parts of test prep (and the one that students like the least) is extensively reviewing each test right after they take it. Students need to go through each question that they answered incorrectly to determine why it was wrong and to figure out why the correct answer was a better choice. This isn’t easy to do in a class setting, so ask about how they will be able to do this. When left to review tests on their own, even the best students will simply go through the test and read the correct answers. It is very hard for them to figure out why they missed questions, so they get frustrated and move on to the next question. At the beginning of this process students simply don’t believe that there is any way to understand what seems to be truly mysterious reasoning behind the correct answers. It is a tough process to figure out the logic behind the SAT, particularly on the critical reading section. And the only way to really develop an understanding of this logic is to work through numerous practice tests and to really understand why the correct answer is correct. I have never met a student who couldn’t figure out this logic if they put enough effort into it. However, it always takes a lot of guidance and hard work. And it can only be achieved by really understanding what went wrong on practice tests. No class will be able to provide completely individualized test review. So I highly recommend that students aiming for large score increases and/or very high scores follow up the class with a program that provides College Board practice tests and one-on-one tutoring. In the next post in the series I will discuss questions that you should ask about homework and class size. You have identified some SAT classes in your area that sound promising. Now you are ready to call them and get the information that you need to determine which one will be a good fit for your child. I have discussed the first four questions that you should ask in a previous post. The question of what materials the class uses is so important that I will devote this entire post to it. Question #5: What Materials Will the Class Use? 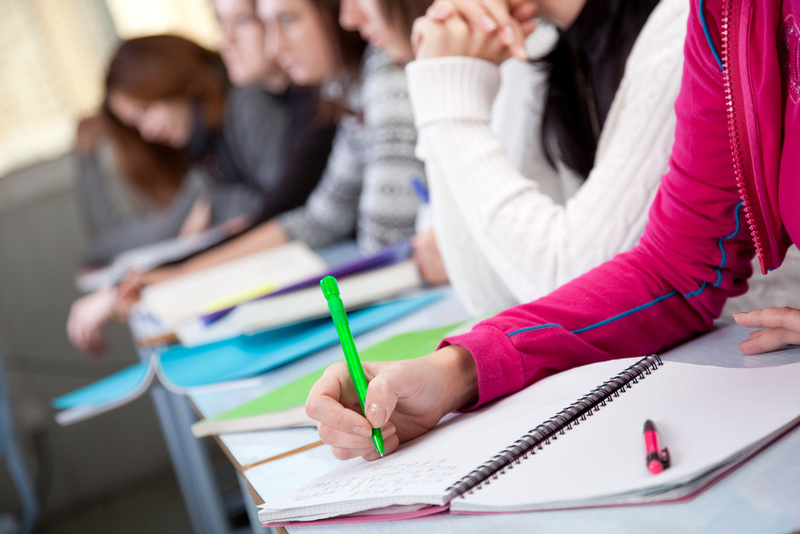 Tutoring centers use a wide variety of different materials to prepare students for the SAT. Many use commercially available books like Barrons or McGraw Hills. Others create their own materials. Note that it is not just Princeton Review and Kaplan that create their own materials. I have seen small test prep companies do this as well. And still other tutoring centers use College Board materials. After having taught the SAT for 7 years and buying just about every SAT prep book available, I have discovered that College Board practice tests are essential for an effective prep program. Many other practice tests come very close to replicating the SAT questions, but they are always just different enough that students end up learning the wrong strategies and achieving higher scores on the practice tests than on the real SAT. (Note that I have also found practice tests that give lower scores that are even more problematic.) It is essential that the class use College Board Practice tests as the foundation of its curriculum. However, answering authentic SAT questions is not enough to prepare for the SAT. In order to achieve significant score improvements, students need to learn and practice the specific math and writing concepts that are tested on the SAT. The College Board materials are not very effective for this part of the prep program. I have seen many independent books and test center-created materials that do a great job at building students’ skills. It should be a red flag if a class doesn’t have supplementary materials to sequentially teach students the basic concepts and only uses practice tests. Relying only on practice tests is a very ineffective way to prepare for the SAT. The next posts in this series will focus on how practice tests are used, how much homework is given, and class size. What does your child need in an SAT Class? Now that you have determined that your daughter learns best in a classroom environment, how do you find the best class for her? I suggest that you ask some key questions to determine whether a class is truly a good fit for your child. Question #1: What Type of Student is the Class Designed for? Students start at such widely different places in preparing for this exam that the same class will not work for every one of them. Some students struggle with math and need intensive instruction on SAT math. Other students are very strong in math and only need a focused review and to learn the specific strategies for the toughest math problems. Is there a large imbalance between your daughter’s scores on the different sections? For example, her score in math may be much higher than her scores in critical reading and writing. In this case, you will want to find a class focused on her weak areas or else find a one-on-one program that will personalize the program for her needs. Are her scores fairly balanced in the three different sections? Then her overall score will be a good indication of what type of class will work best for her. A good test prep company will analyze your child’s PSAT score and/or give your child an assessment test to determine her starting score. You can then find a class that is designed for students needing more background material (scores 1200-1550) or a class that is designed for students starting in a higher score range (1550-1800). I recommend that students starting with scores lower than 1200 and higher than 1800 avoid classes and sign up for a one-on-one program or a focused self-study program. Question #2: What Score Increase Can Your Child Achieve? How much your child’s SAT score improves will depend greatly on the amount of time and effort that she puts into preparing for this exam. However, this question is still worth asking to determine how realistic the test prep company is about the results of the class. Question #3: How Much Effort Will it Take? Putting in the time to complete assignments is not enough for a significant score increase on the SAT. A good test prep company will discuss the amount of time and effort that will be required to achieve a high score on the SAT. Question #4: Is the Teacher a Good Match? You should also evaluate whether the teacher is a good match for your daughter. Will the teacher keep your daughter engaged and motivated to work her hardest? Will she push hard enough to get your daughter to put in the extra effort that is required to excel on this difficult exam? You should also stop and carefully consider whether your daughter has the drive to put in the extra level of effort that will be required of her. If she doesn’t have that drive on her own, you may want to consider whether a one-on-one program will be a better match for her. In the next two posts of this series on choosing the best SAT class for your child, I will discuss questions to ask about the class materials, how practice tests will be reviewed, how much homework should be assigned, and class size. When will your child take the SAT? If it is anytime during the next school year, this summer is a great time to start preparing for the SAT. 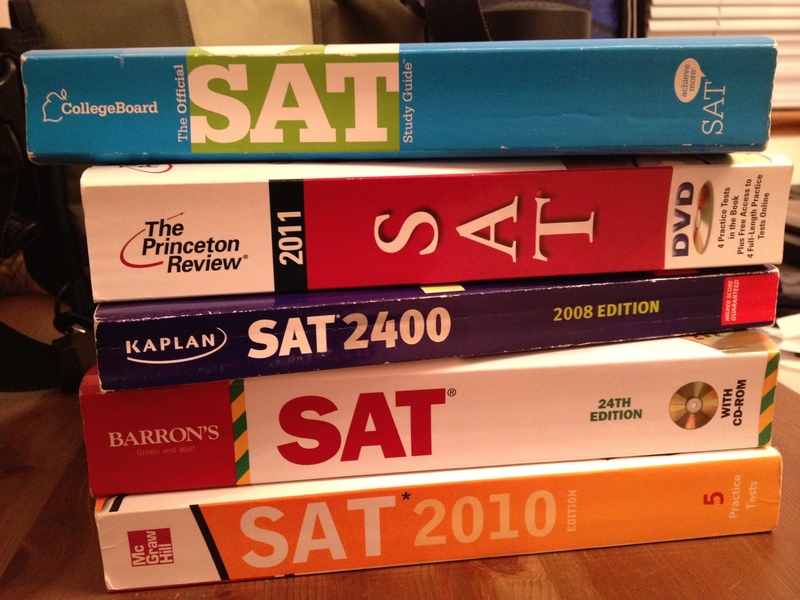 Your child should plan to spend at least 5 hours per week for 12 weeks studying for the SAT. Some students will need more time than this, but I have found very few students who can dramatically improve their score on this difficult exam in less time. 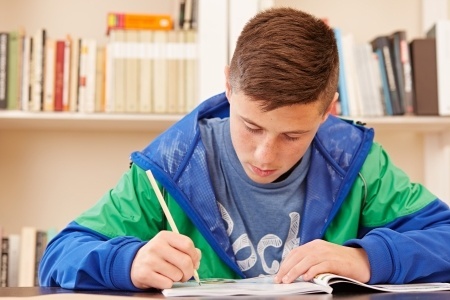 Should you sign your son up for an SAT class or private one-on-one sessions? Or should you simply find the best materials and support him in studying on his own? There are a multitude of options when it comes to SAT test prep and different solutions work for different students. Many people believe that one-on-one tutoring is the very best option if parents can afford it. I have found that this is true for students who don’t tend to test well or who need extra help in some areas. Make sure that the program is truly personalized (many aren’t and will bring exactly the same materials for every student regardless of their unique needs) and your son will be able to spend more time on the areas that he struggles with and just do a brief review of other areas that he remembers well from school. I have discovered that one-on-one instruction is not always the best option for all students. Some high achieving students are actually more comfortable in a class setting where they are not the focus of attention the entire time. They can absorb the information without feeling that they are in the spotlight. These students prefer to be able to simply stop the instructor whenever they have specific questions. And of course the lower price tag on classes is nice too! 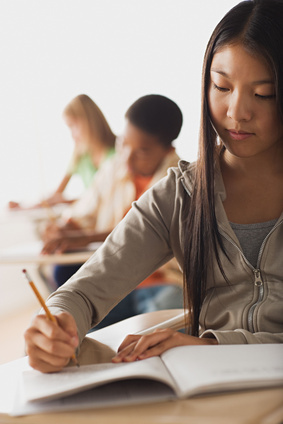 Studying alone can be a great option for SAT test prep as well. But I only recommend this for highly motivated students and I strongly advise parents to find a highly experienced tutor to help you design a program that will work well for your child. They should also meet with her once a month or so just to ensure that she stays on the right track. This series on Summer SAT Test Prep will continue with detailed posts on how to choose the right class, how to choose the right tutor, and a list of resources for self-study. You are ready to start your child in an SAT Preparation program to get her the score she needs to be accepted at the best colleges. But don’t skip the most important step! The best way to design a truly effective SAT Prep Program is to start by determining your child’s target score. And the best way to do this is to make her college list. What are the best colleges for her? Will she be happier at a small college or a large one? Is she interested in pursuing a science degree or is she interested in applying to an art program? She can wait to make her college list and this is exactly what most students do. But researching colleges now, at the beginning of the SAT Preparation Program, is the best way to get started. There is a lot of material to cover for the SAT. Developing a clear idea of how much she will need to cover in how long a period of time is the best way to develop a road map to get there. The colleges and specific programs that she will apply to will determine what target SAT score your daughter should be aiming for. This target score, and the amount of improvement needed, will determine what she needs to study for these exams and for how long. Unfortunately, most tutoring companies do not consider most of these factors when suggesting a tutoring program for your child. And many test prep programs use the same SAT or ACT materials and the same format for every student who signs up for a test prep program (even for one-on-one sessions), regardless of any individual student’s current projected score or target score. So it is imperative that you figure out what your daughter needs or that you make sure that you are getting the advice and the test prep program that will work for her specific needs. The college list may even impact when your your child needs to start studying for the SAT/ACT. Many art and theater programs put far more weight on the application essay and the audition or portfolio than on the SAT or ACT scores. Students who are pursuing these programs may need to start working on their portfolios and auditions first. 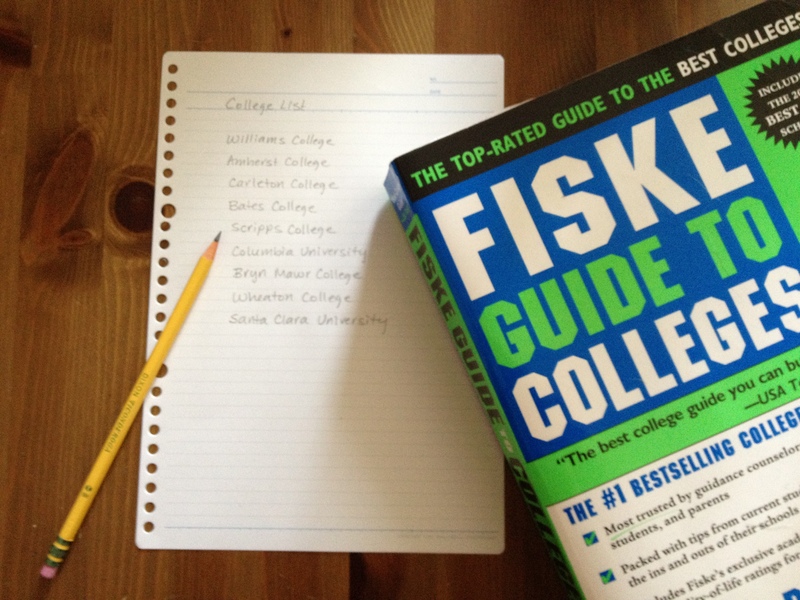 There are many resources to help you research colleges on your own. I would also be happy to refer you to one of the advisors in my network who specializes in the area that your child is pursuing. They can be very helpful in selecting the best programs and colleges for your child as well as in helping her navigate the admissions process. What SAT Score Will Your Child Aim For? It is best to determine the desired SAT score your child will aim for before he starts to prepare for the SAT. This is the score that he needs to achieve to get into the colleges at the top of his list. I have many students who strive for a perfect score on this difficult test, but most of my students end up setting their sights lower when they realize that a 1900 or a 2250 will get them into the most competitive colleges on their list. “But why not shoot for a perfect score? It can’t hurt, right?” a lot of my clients ask. This is true: achieving a higher score will never hurt a student. But achieving a perfect or near-perfect score on the SAT takes an enormous amount of time and effort. And even more importantly, it takes an incredible amount of motivation. Before I accept 2400 as a student’s target score, I need to find out if the student wants this score so badly that he will spend countless hours doing the toughest problems and practicing strategies to improve his timing on the test. This motivation cannot come from the parent. It must come from the student. Because it is the student who will have to spend the long hours working through the difficult problems that show up on this test. It is the student who will have to have to dig deeper into seemingly unsolvable math problems and indecipherable critical reading passages to find his way to the correct answer. In the next post I will start you on the process to determining your child’s target score.